Back at the parking lot after a nice long skate out on one of the local rail trails a woman whose car was parked next to mine struck up a conversation with me. As we talked I learned that she and her friend are avid cyclists. They are out on the trails doing anywhere from 10 to 25 mile rides 3 to 5 times a week. For a moment I was surprised to hear about how much time they spent exercising because she and her friend were both very overweight. Then I remembered, cardio alone is not enough. Note: I don't know for sure what if any other exercise they do. I don't know what their diets look like. And frankly, I have no idea if they even want to lose weight. So, I'm going to make an educated guess and fill in the missing pieces in order to make a point that could help you get better results. The question is, with all this activity, why are they so overweight? Shouldn't all this cycling make them thin? Top cyclists are certainly light and lean. The key is that someone doing something like racing in the Tour de France or leading the Boston marathon is exercising at a level of intensity that doesn't happen in your typical cardio session. Another problem with steady state cardio is that the body is an adaptation ninja! It's focus is survival and it will do what is necessary to conserve precious energy and fuel stores (i.e. body fat!). The result is that your body gets really efficient at doing moderate intensity cardio. It learns to burn less and less fuel (ant fat) to do the work, the exact opposite of what you're trying to accomplish with your workout. Should you even do cardio? There are several key components to being successful at weight loss, but for now I'll just focus on exercise. Effective exercise for weight loss doesn't require any steady state cardio at all. But that's good news. After all it's time consuming, often times tedious and boring. Not to mention it's a great strategy for creating over use injuries. What kind of workouts should you be doing instead? Resistance training and high intensity types of cardio like HIIT and metabolic conditioning workouts. Make them your primary modes of exercise. Save your favorite steady state activities (like inline skating or cycling for example) to do just once a week or less. So, why resistance training? Resistance training builds lean muscle which you really want. Ladies, this does not mean you will get big and bulky. Muscles are important for a strong healthy body and more muscle means a higher metabolism. Three of these workouts a week is a good bet for building lean muscle while also giving the body enough time to rest between sessions. High intensity cardio sessions like HIIT and metabolic conditioning workouts are the key to making cardio work for you. You will work really hard during these sessions, as hard as your fitness level will allow. Your reward for this hard work is shorter sessions than traditional cardio and a much longer after burn. After burn is the extra calories you burn after a workout versus the calories you would have burned normally. Try adding a couple of these workouts to your routine each week. If you enjoy an activity that falls into the steady state cardio category, you can still do it. 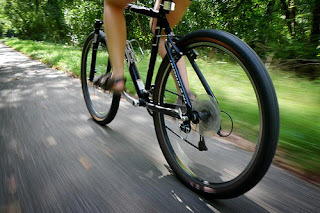 I love to hit the rail trails on my inline skates in the nice weather and I would never tell those cyclists to give it up. The thing to remember is to do these activities for enjoyment, not as a staple of your weight loss plan.